We learn a lot by pouring wine for customers (and have a lot of fun, too). Sometimes we’ll pour for a few hundred people a night. We try to interact along the way but it’s often a bit rushed on both sides of the table. So when we notice patterns in responses to our wines, it usually sticks with us. For example, we often hear, “Oh, you serve your Pinot Noir slightly chilled.” And we respond by talking about how the delicate berry flavors are best focused, preserved, and enjoyed when the wine is cooled down a bit. Otherwise, the wine can seem a bit flabby, we'll occasionally add. Sometimes we get perplexed looks back. Other times, it seems to register. So in response, let’s explore how the temperature of wine impacts its taste. First, consider an illustration from outside of the wine world. Coffee is a great example of how serving a beverage at different temperatures changes how it tastes dramatically. I drink hot coffee black (and particularly enjoy it that way). But for iced coffee, I need milk. It’s just too bitter otherwise. A similar principle applied to food and wine pairing takes alcohol into consideration. Since alcohol is experienced on the palate as heat, high alcohol wines generally do not pair well with spicy foods. It’s just too overwhelming. These are two examples of balancing flavors and sensations. Sometimes we want to accentuate them instead. For example, our 2015 Pinot Renoir mentioned above has a “flavorful burst of sweet berry fruit” (according to Wine Enthusiast magazine, anyway). It’s not actually a sweet wine, but it’s reminiscent of such named flavors (and our taste buds often associate “fruit” with “sweet”–some describe this aspect of certain dry wines as "fruit sweet" vs. "sugar sweet"). So when you eat berries, you probably prefer them a little chilled. Of course they can be served too cold (like frozen) but a hot berry isn’t anyone’s idea of a good time. Anyway, at 14.4% ABV, our 2015 Pinot Renoir is not especially shy in that regard, so cooling it down a bit helps balance the wine as well as accentuate the pleasing berry notes. 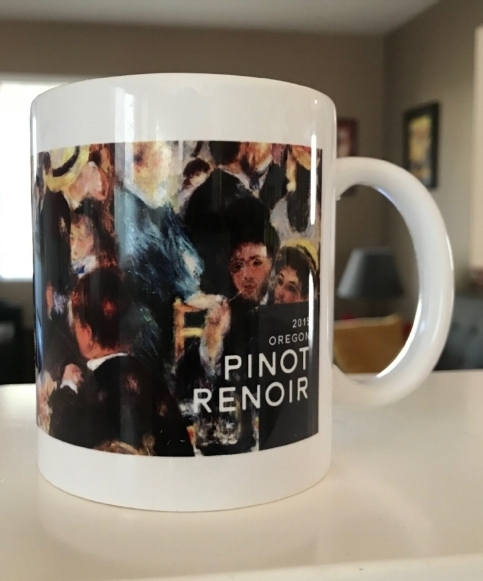 Yes, we serve our Pinot Renoir slightly chilled. And so should you. Vinho Verde, Albariño, and simple sparklers like Prosecco @ 45˚F (a few hours in the fridge then straight to your glass–or lips). Chenin Blanc, Sauvignon Blanc, Sémillon, Pinot Gris, Chablis, Unoaked Chardonnay, and Champagne/Cremant/Cava @ 50˚F (chill for a few hours then take out of the fridge for about 20 minutes before serving). Oaked Chardonnay and Riesling @ 55˚F (chill for a few hours then take out of the fridge for half an hour or so before serving). A simpler Riesling could be served cooler. Beaujolais/Gamay, Pinot Noir, Dolcetto, Barbera, Valpolicella, Malbec, Grenache/Garnacha @ 60˚F (depending on the starting temperature, chill for 60-90 minutes before serving). Cabernet Sauvignon, Merlot, Bordeaux blends, Chianti, Cabernet Franc, Rhone blends, red Rioja, Syrah/Shiraz, Zinfandel, Barolo, and Barbaresco @ 65˚F (again, depending on the starting point, chill for 30-45 minutes before serving). 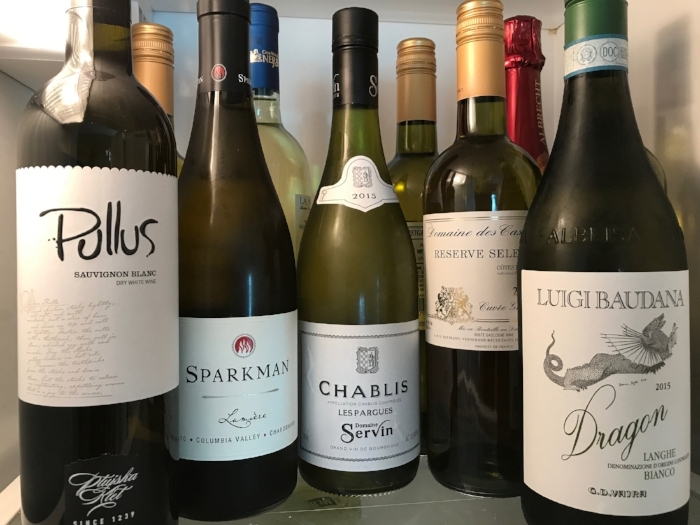 Sure, keep a variety of white wines in your refrigerator. Just plan ahead for when to take a particular bottle out. You may be wondering what ever happened to serving red wines at room temperature? In short, I can only ask that you please forget you ever heard that. It’s a guideline that has been with us a very long time (probably hundreds of years) and has now fully outlived its usefulness. Construction standards, HVAC technology, and our climate have all changed significantly since the heyday of lords and ladies. Serving white wines refrigerated and red wines at room temperature is just too simplistic a guideline for modern times. In fact, there’s almost never a case when any wine should be consumed at room temperature in the real world. Shocking, I know. You’ll notice that the most complex, biggest bodied red wines mentioned above should be served at 65˚F (the very high end of “cellar temperature”). How often is your home (or favorite restaurant or winery tasting room) 65˚F? Rarely. If your heat is set to 68˚ or 70˚ in the winter, drinking a light bodied red wine (or even a full bodied red wine) at room temperature is going to impact the experience negatively. And since you paid money for that wine, why not get the most out of it? If your AC is set at 76˚ or 78˚ in the summer, then you can see the issue there as well. This isn’t some silly wine snobbery, these are tried and true guidelines for getting the most enjoyment and pleasure out of your hard-earned wine. Here's a bad idea if you need one. . . 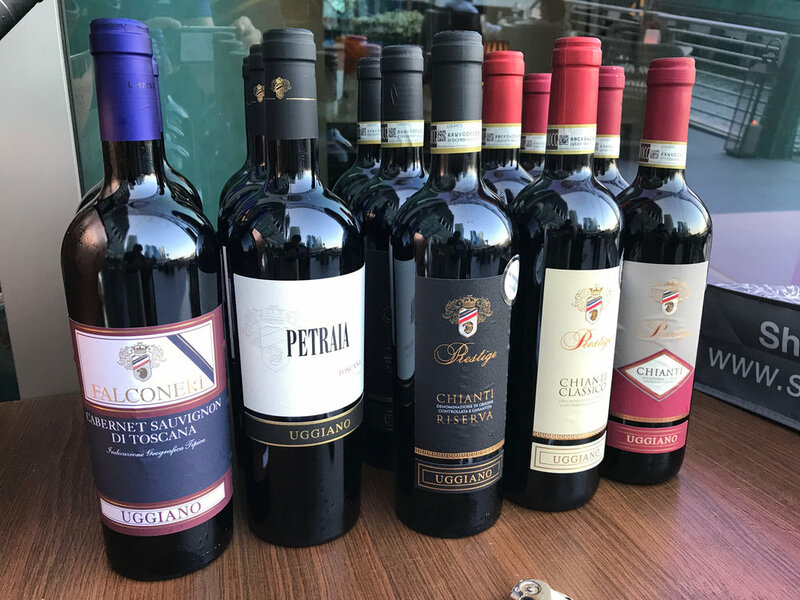 Serve several substantial Italian red wines at "room temperature" for an outside tasting event in equatorial Singapore (where "al fresco" is shorthand for "no air conditioning"). Buying a dusty bottle of red wine from a market with no air conditioning in Hawaii and taking it home to serve at room temperature would be misguided. For multiple reasons. Wrap the bottle in a wet paper towel and put it in the freezer for 20-30 minutes. Submerge the bottle in icy water (ice alone allows plenty of air pockets which insulate more than chill). This is the fastest way to chill wine. Also, my favorite tip for keeping your wine at the best temperature is to drink it from a coffee mug. After all, mugs are built to keep liquid at a consistent temperature for as long as possible. Plus, it’s nobody’s business what’s in your cup! Our famous wine mug maintains the intended temperature of your wine longer than a glass. But how do you know what temperature your wine is? We put 5 wine thermometers to the test. We are here for you! We have our 2015 Pinot Renoir exactly where I want it. I got kind of excited about this wine temperature topic and decided to test out some gadgets. I tried to be logical in my approach but do not claim any final authority on this (or any other) subject. Please also note that we are not promoting any particular brand at Drum Roll Wine so I'll refer to these wine thermometers as "A" through "E" as you'll notice in the photo above. There are also different manufacturers of similar styles of thermometers but we only tested one of each type. A. The obvious disadvantage to this traditional thermometer is that you have to open a bottle to use it. However, you can also open a bottle, drop the thermometer into it, and put it in the fridge (if you have the vertical clearance) to bring the wine down to proper serving temperature. There's usually no harm at all in opening a bottle a little while before pouring it (though you should not expect this to have the same effect as proper decanting). 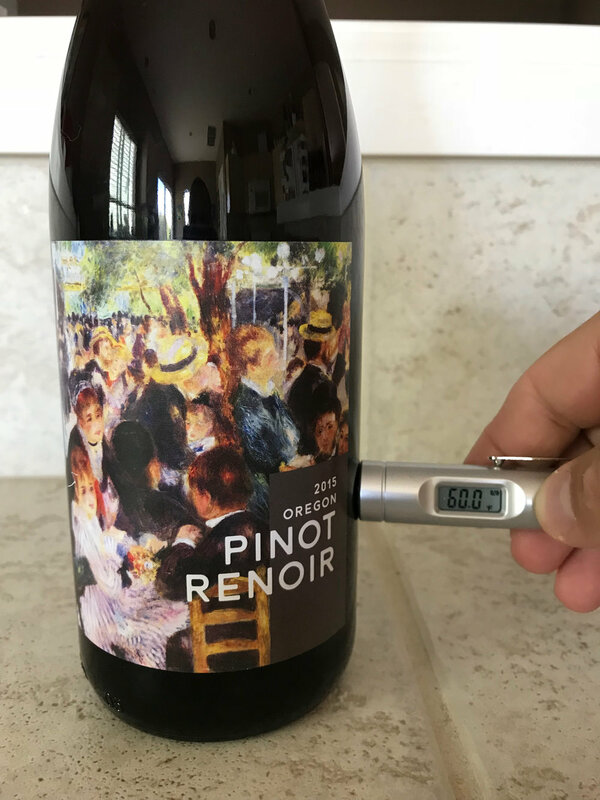 You can also use this thermometer to measure the temperature of an individual glass of wine (unlike any of the other products tested here save "E"). Having said that, the primary application for this type of thermometer is likely in the preparation of craft cocktails. The glass construction is fragile (though this manufacturer offers a 5-year limited warranty and the product is indicated as dishwasher safe). This is the only analog option tested which comes with its own advantages. I like the feel of the grip, too. The temperature guide included is generic and contradictory (listing "Burgundy" red wines as best served in the range of 63˚ to 65˚F but Pinot Noir in the range of 58˚ to 60˚F). This device did seem the most reliable at the actual task of measuring the temperature of wine but I have no absolute way to verify that. B. This thermometer is physically flexible, clips onto a bottle easily, and is reasonably quick to establish the temperature. The edges will scratch a label when removing if the user is not careful (which may matter in a restaurant setting). There are some odd recommendations on the box including instructions to serve Chianti in the same temperature range as “Rose” (46˚ to 54˚F) while “Medium Cherry” (your guess is as good as mine) should be served in the 50˚ to 57˚F range. There’s also a temperature suggestion for “Aperltie” (even the all-knowing internet doesn’t register on that one). Since the manufacturer is from the Netherlands (where very fine English is routinely spoken), I’m guessing the instructions were written elsewhere. The printing on the product itself seems to have benefitted from a copy editor as it reads “Aperitif." But as an extremely broad category, I’m not sure why a suggested temperature range would be given at all. At any rate, the product did seem reasonably accurate and the cost made it a low-risk purchase. C. While the packaging here is quite generic, I did enjoy the user instructions: Put on the bottle, then you can see the temperature of the wine on the screen. And that pretty much sums it up. Unfortunately, the product is preset to measure in ˚C and in spite of my best efforts, I could find no way to switch it (inserting a paperclip into the pin hole got me nowhere). While I appreciate the rational nature of the Celsius scale, I'm just not going to remember two different guidelines to wine temperature. The band material is rigid so it can only be slid over the top of a bottle (unlike option "B" which clips on more flexibly). This device requires (and includes) a 1.5V battery and turns off when removed from a bottle. It is a bit slow to register a final temperature reading and didn't seem especially accurate. D. Snapping this on a bottle is pretty fun and I really like the integration of a temperature guide on the back of the product itself (no other material to keep up with) in both ˚F and ˚C. The guide is a bit generic, however, and, similar to "A" above, provides two different temperature ranges for Pinot Noir as a variety and Bourgogne as a region. It also seemed a little slow to register a final temperature and I wasn't sold on the accuracy. E. I'll just say it upfront–Infrared. BAM! This is the quickest of all the thermometers and also seems accurate (it was inline with results from "A"). It has a handy pocket clip as part of the design so for sommeliers on the go (or in the lab?) it may be a nice feature. It does require two (included) 1.5V batteries but has a 15-second auto-off feature to preserve battery life. Like "A," this device can measure bottles or glass pours. But it seems to be measuring the vessel itself rather than the liquid inside it (a small distinction, for sure, but a bottle from the fridge and a glass from the cabinet are different temperatures and a just-poured glass will not immediately plunge to the temperature of the wine inside it). There are puzzling suggestions given for Big Red, Good Red, Rose, Fine White, and Good White. Make of that what you will. My conclusions? I appreciated the immediacy, accuracy, and flexibility of "E," the accuracy and cost of "A," and the value of "B." I do not recommend "C" or "D" but may continue to experiment with them in case I've rushed to judegement. We always appreciate a chance to learn something new about wine. And we love a good wine surprise. Have one to share? Email us!